Crewmembers from JetBlue’s Technical Operations and Flight Operations teams arrived at Aviation High School (AHS) to participate at the school’s annual Career Day—and get this—it took less than 12 minutes to get there. Crewmembers from JetBlue are familiar with the career and technical-focused high school, which sits less than one mile from JetBlue’s New York City Support Center in Long Island City, NY. The school is a familiar place to them—not just because of its proximity, but as the place where many of JetBlue’s crewmembers started their aviation education. In fact, JetBlue is proud to say that hundreds of its crewmembers are alumni of AHS. The ‘school next door’ is the nation’s largest public aeronautical high school. More than 2,300 students, primarily from traditionally under-served communities, attend AHS. The graduation rate, college attendance and job market entries are high and continue to grow each year. Currently, AHS has a graduation rate of 94%, becoming an incubator for aviation talent locally and nationally. In 2016, AHS received its second grant from the JetBlue Foundation, for $25,000. The grant money was provided to fuel a Technology Improvement Plan so students have access to updated technologies and tools needed to prepare them for tomorrow’s job market. These grants are critical to keeping the curriculum relevant and this is just one example of the many programs JetBlue has in place to continue pathways to real careers. At the June commencement ceremonies, Walter Kerzner, co-founder of JetBlue’s Aviation High School internship program and a JetBlue Aircraft Maintenance Manager, was recognized as ‘Man of the Year.’ The JetBlue internship program has provided hundreds of students with the opportunity to learn about the aircraft mechanic track, while working side-by-side with JetBlue technicians. After completing their academic coursework, many of these students even enroll in JetBlue’s apprenticeship program, which Kerzner also co-founded, leading to tracks that result in further career opportunities. The JetBlue Foundation has a lot to celebrate, and as 2018 comes to a close, join us as we take a look back on some of our favorite memories of the past year. 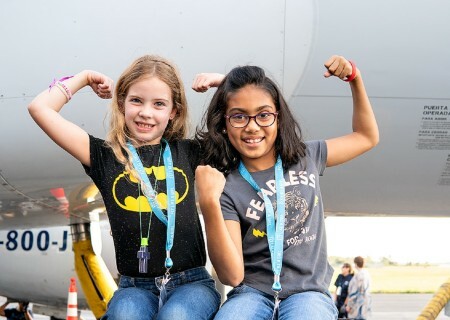 The JetBlue Foundation continued its partnership with Project Scientist to introduce science, technology, engineering and math (STEM) education and aviation careers to girls from traditionally under-represented communities.